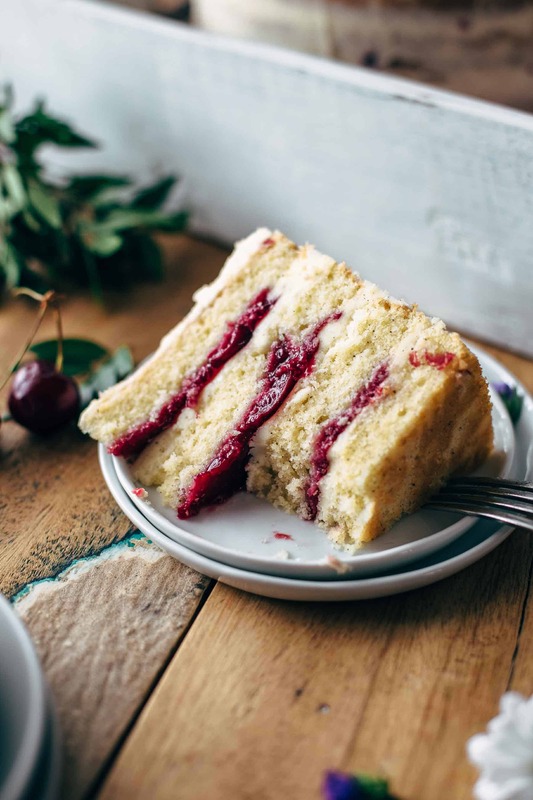 Make this Fresh Cherry Cake recipe from scratch! Soft and moist vanilla cake meets 5 ingredient cherry pie filling and creamy vanilla buttercream. With video! 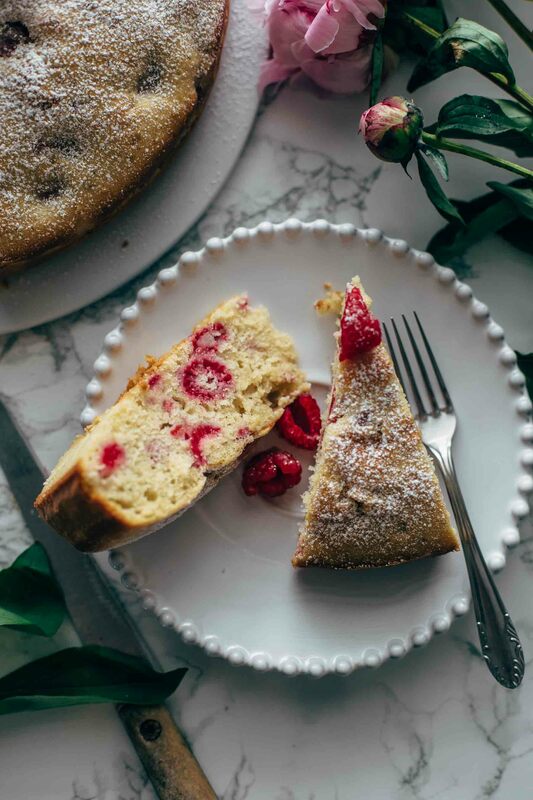 This Cherry Cake will fulfill your deepest cake cravings. I’m a true believer in eating seasonally. When cherries are in season, then let’s eat cherries. Easy right? Cherries are one of my favorite fruits at all and my absolute favorite stone fruits. Peaches are also great stone fruits. Did you see my Almond Peach Galette last week? The perfect summer treat, guys! To honor cherries the best possible way, I decided to make a vanilla cake with vanilla buttercream and a cherry pie filling to get the most out of the cherry taste. The cherries are dominating the cake flavor but positively. The whole cake has a strong cherry taste but it doesn’t taste just like cherries, the vanilla cake and buttercream are very present either. For the vanilla cake, you need 9 ingredients. Start with combining flour, baking powder, and salt. Set aside. In a large bowl, cream together butter, oil, and sugar. Add 4 large eggs, one at the time, and mix to combine. Then add vanilla. I added 3 real bourbon vanilla beans. You can substitute with 3 tsp = 1 tbsp pure vanilla extract. Maybe you think that this is too much. But trust me. It is the perfect amount for this Cherry Cake. You may wonder why I added butter and oil. The butter adds a buttery taste to the vanilla cake. The oil leads to a better texture. It makes the cake soft and moist. 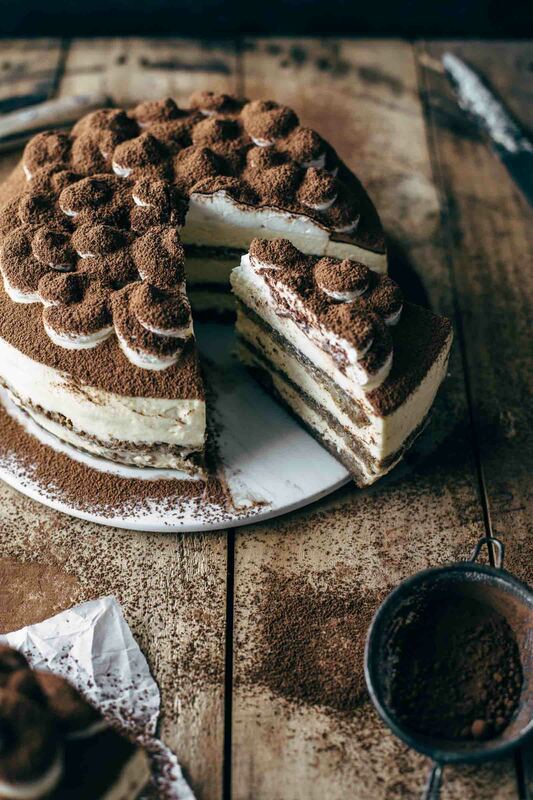 To add both to the cake brings together the best of both worlds. Alternately add dry ingredients and buttermilk. Start and end with dry ingredients. I add the dry ingredients in 3 batches and the buttermilk in 2. 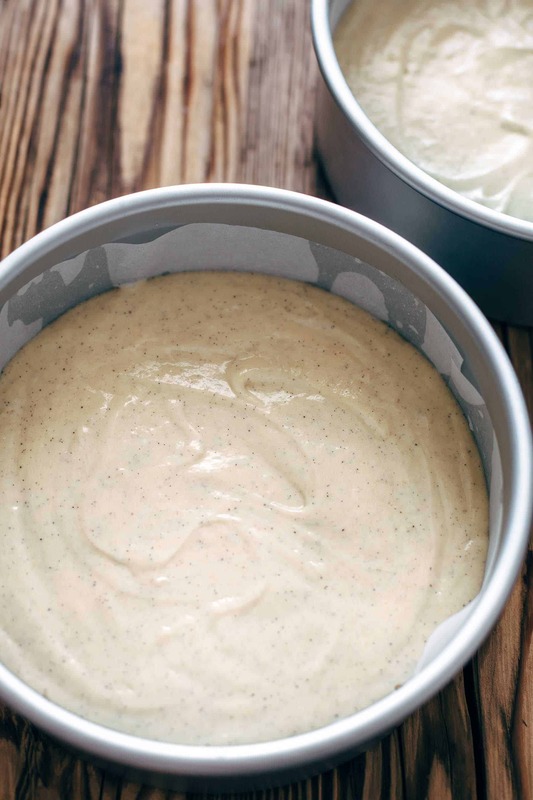 Divide into two 8″ (20cm) round cake pans equally. Maybe you use a kitchen scale to get two equal cake layers. I always layer my cake pans with parchment paper. If you want to do it as I do, cut out a parchment paper circle in the size of the pan and lay into the bottom of the pan. Then cut 2-3 inch strips for the sides. I smear a bit of fat (oil or butter) or spray baking spray underneath that the paper stick to the pan. For me, this is the easiest way to get the cake out of the pan. Because when the cake cools down, I place my hand on top of the cake, flip the pan upside down and remove the paper. I place the cake in the way I baked it on a plate (upside up, downside down). 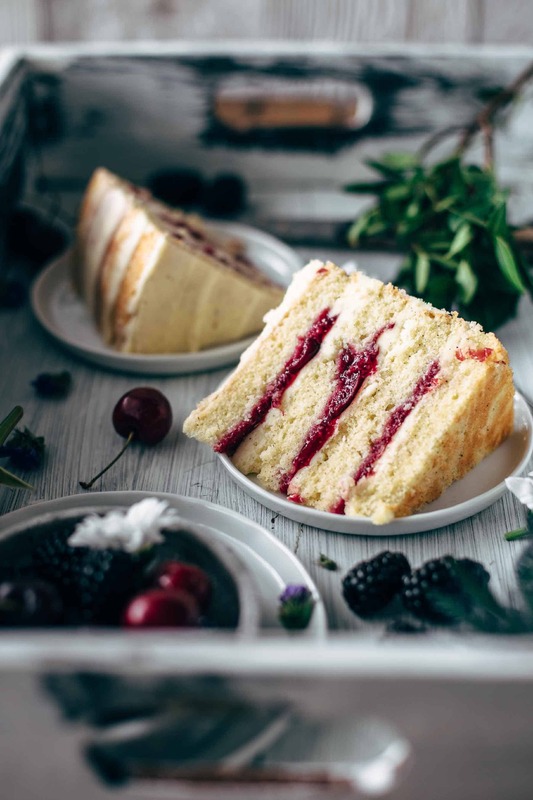 Cherry Cake with Cherry Pie Filling. Yes, you read correctly. I made a cherry pie filling for this cake but cooked it longer and purred the cherries in-between cooking. It was like cherry jam in the end. Pitting cherries can be time-consuming. You can speed this process up by using a pitter. When you don’t have a pitter, cut cherries in half and remove the pits by hand. Place pitted cherries, sugar, cornstarch, lemon juice, and water in a large saucepan. Bring over medium heat to a boil and cook for about 5-8 minutes until the cherries are soft and the liquid starts looking like syrup. Blend cherries with an immersion blender that it looks like a puree but with small cherry pieces in it. The more you blend, the more even the consistency is. I like it when there are still cherry pieces in the filling but blend as much as you want. It is your Cherry Cake. You have to like it. After blending cook another 5-8 minutes until the filling is thicker and reduced by about 1/3. Let cool to room temperature. The buttercream is creamy, has an intense vanilla taste, and is a great combination to the cherry filling. Beat butter until creamy. I mean very creamy. The best is using softened butter. Just take it out of the fridge when you start with the cake and let it on the counter until you make the buttercream. If you use butter straight out of the fridge, then beat it long enough until it is getting soft and creamy. You could also put the butter into the microwave for a few seconds. But please watch out, that the butter is 1st not getting hot and 2nd not melting. I think beating it longer is safer. Add powdered sugar to the creamy butter. One cup at the time. Mix until creamy and sugar is completely dissolved. Here again 2 real bourbon vanilla beans. I know using 5 real bourbon vanilla beans in one cake is a bit pricey, especially when you use organic ones as I do. You can substitute with 2 tsp vanilla extract again. 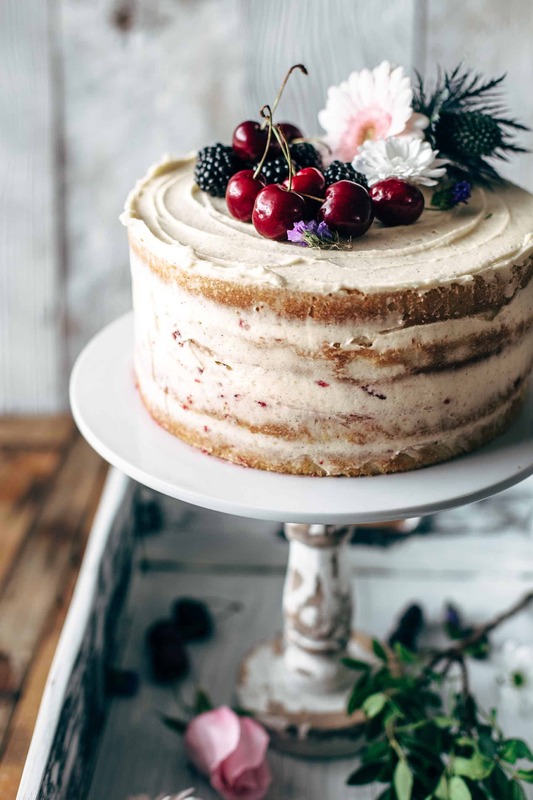 As you can see in the pictures, I used less buttercream for this Cherry Cake and made a naked cake. 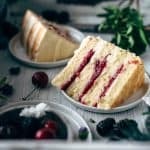 The buttercream is supposed to support the cherry filling and makes sure that the cherry filling stays between the cake layers. Trust me. It is enough buttercream. It is sure not the quickest cake recipe but worth every minute! Imagine the look in your family and friends faces when you tell them you made a Cherry Cake with cherry pie filling. I mean, c’mon! 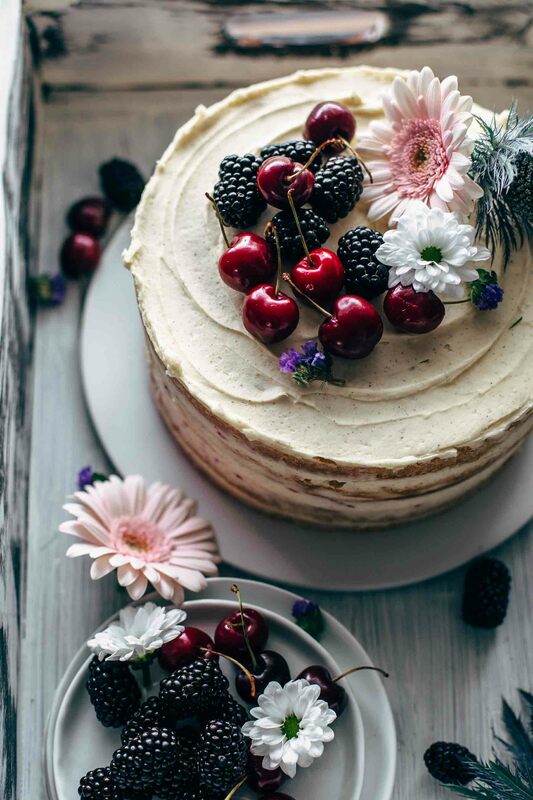 Make this Fresh Cherry Cake recipe from scratch and leave a comment, rate it and tag a photo #alsothecrumbsplease on Instagram! Would love to see your snap! 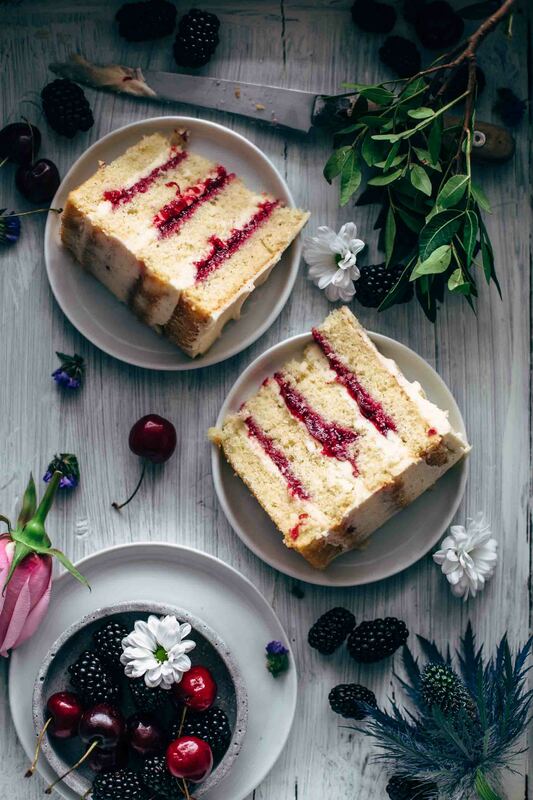 You may also like Easy Raspberry Cake Recipe From Scratch, Authentic Black Forest Cake Recipe, Bananas Foster Cake, Tiramisu Cake Recipe, or click here to see all recipes. 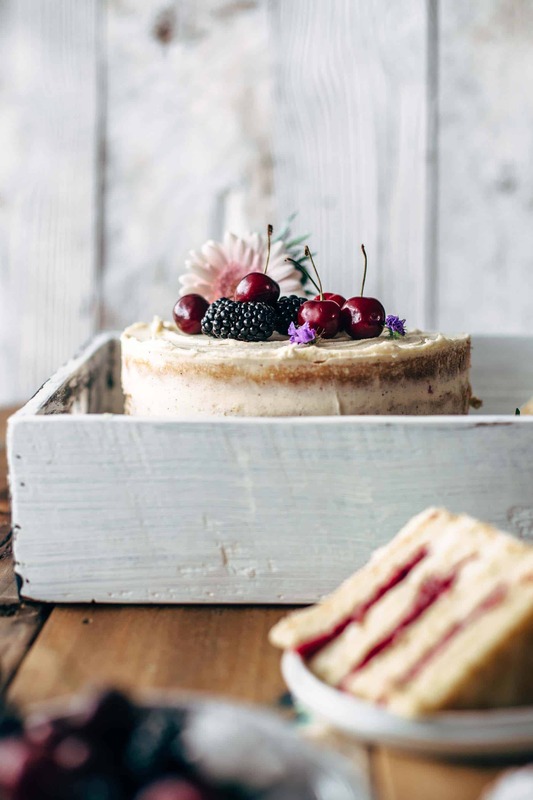 Make the vanilla cake: In a large mixing bowl with a stand or handheld mixer fitted with a whisk or paddle attachment, beat butter, oil, and sugar until creamy for about 2-3 minutes. Add 1 egg at the time and mix until fully incorporated. Add vanilla* and stir to combine. Alternately add dry ingredients and buttermilk, beginning and ending with dry ingredients. Stir just until combined. Divide batter into the two prepared baking pans equally. Bake for 30-33 minutes or until a toothpick in the center comes out clean. Don't overbake or the cake will be dry. Let cool to room temperature. Make the cherry pie filling: Place all ingredients in a large saucepan and bring over medium heat to a boil. Cook for 5-8 minutes until the cherries get soft. Stir constantly. Blend cherries with an immersion blender. Cook another 5-8 minutes or until the filling has thickened and reduced by about 1/3. Stir constantly. Remove from heat and let cool to room temperature. It will thicken as it cools. Make the vanilla buttercream: In a large mixing bowl beat butter on medium speed until super creamy, about 2-3 minutes. Add 1 cup powdered sugar at the time and beat on low speed until combined. When all the sugar is in, beat on medium speed until the sugar is dissolved. Stir in vanilla*. Mix in 1 tbsp heavy cream at the time until you reach your desired consistency. The buttercream should be creamy and fluffy but firm enough to spread. I added exactly 3 tbsp. Add a pinch of salt and stir to combine. Assemble the cake: Cut a thin layer off the tops of your cakes to create a flat surface. Then cut each cake in half horizontally. Place one cake layer on a cake stand or serving plate. Spread 1/4 of the buttercream over the cake. The buttercream should be higher around the edges that it holds the cherry filling inside the cake (watch the video for better understanding). Layer with 1/3 of the cherry filling (where the buttercream is lower). Repeat two more times. Place last cake layer on top and lightly frost the outside and the sides of the cake with the remaining frosting. Chill 4 hours in the fridge. Store leftovers in an airtight container in the fridge up to 2 days. Hi there! 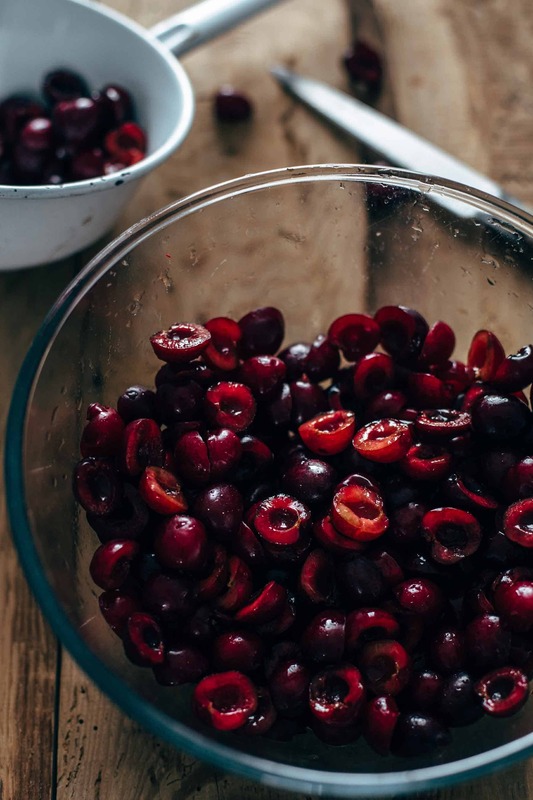 Did you fresh tart cherries or a sweeter bing cherry for filling? Hi Anita, I used sweet cherries for the recipe. You can use tart cherries as well if preferred. In this case, increase the sugar by about 1/4 cup or to your taste. Hello! Can i use frozen sweet cherries? Yes, it’s possible to use frozen cherries. The directions are the same. Cook the cherries until they are fully thawed. Can you use a different kind of fruit, such as peaches or blueberries?.. Yes absolutely. You can find recipes with peach, cherry, cranberry, and blueberry fillings in my cake archive. They are all similar. Question, I know fresh is always best but not easy to find good ones in with her time around here. Could you use frozen cherries? Yes, absolutely fine. Thaw frozen cherries and proceed as described.